This topic contains 13 replies, has 5 voices, and was last updated by Bill Epler 2 months ago. Starting to look at installing solar panels on my 32. Would be interested hearing about your experience adding panels. Who did the install? How effective are the panels? Anything you would do different? Hi Angelo, Happy New Year! We installed 2 fairly large panels on the Pilothouse roof of Pilitak (NT37) a year ago. The panels are monocyrstalline, solid aluminum framed with glass tops and are about 280 watts each (if I remember correctly – close anyway). Put on the largest panels you can fit! More is better in this case and the price difference in up sizing is not substantial when looking at the whole project. Use MPPT type of controller, not the PWM type (especially for converting the unused voltage into useable amps). Some suggest using a separate controller for each panel which will maximize input when there is partial shading. I only used one Morning Star MPPT controller with a remote panel for “watching what is going on”. Use a quality brand controller (not the place to cut costs). Other good brands include: BlueSeas, Outback, Genasun, etc. Mount them in a location where shading from overhead items will be minimal and unless you are going to automate having the panels “point to the sun”, mount them basically flat, pointing straight up. I installed mine so as to not penetrate the roof. Worried about future leaks. I attached stainless steel tubing to the existing hand rails above the pilothouse doors, to make a “mounting frame”. I then attached the panels to the tube “frames” using four (4) plastic adjustable “tube mounts”. I did the physical install myself, but did use a marine electrician for the electrical, but it was fairly straight forward for someone with some DIY electrical experience. Anyway, I am happy with the total install after one season. Any day where the sun was out (not foggy) the solar restored my battery bank back to 100% each day by about 2PM (or earlier). I only ran the generator to make hot water (on a couple of occasions) and when we had heavy fog for a few days! We were out for over 3 months and put about 20 hours on the generator. Most of the time we were at anchor or docks with no power (say 70% of the time). We were out in over 30 knot winds, and did not have any problems with the mounting system. And Happy New Years to you and Terry as well! Thanks for your reply. Your description is very helpful and is a good starting point for looking at how to approach this project on our boat. I had not thought about using the side rails on the pilothouse. Sounds like a good idea. Thanks for the offer for follow up. As we get into this, may just do that. I put 2×365 watt LG panels a year ago. Really pleased with the performance. Like Tom, I know use the generator pretty much exclusively for hot water during the summer. During winter the generator still earns its keep. Forgot to mention I think the same panels would fit on a 32 pilothouse if it doesn’t have the hatch in the middle (or you don’t care about covering it). Thanks for your post. Your website is impressive. Look forward to reading about your experiences with solar cells and energy in general. We had two 325 watt panels put on Kittiwake, our NT 32. They’re quite large, but they do leave room for the hatch to open. Kittiwake does not have a generator, and that’s just fine. The panels keep us powered up at anchor. We run the refrigerator 24/7 but don’t have a separate freezer. We’re looking for recent vintage 37 or 39, and we’re so pleased with the performance of our solar set up that job #1 on the the next boat will be to install solar panels and remove the generator if it is practical. 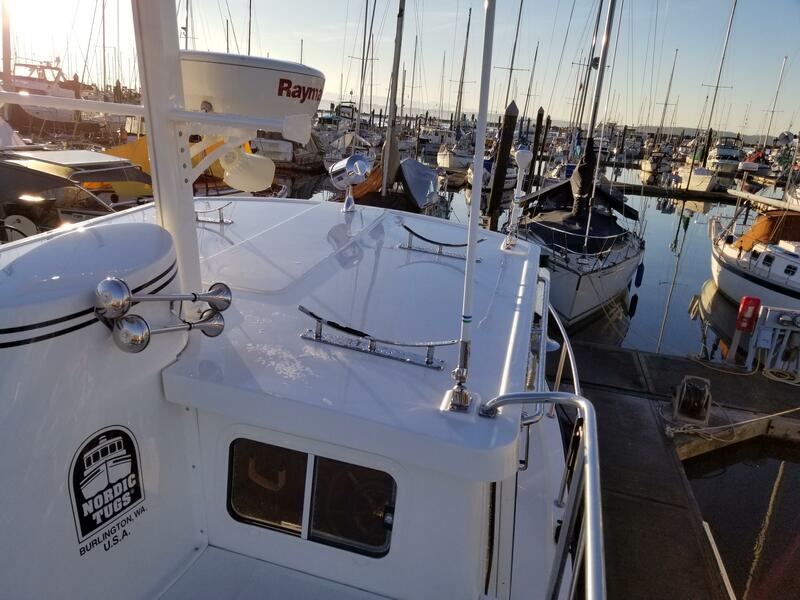 Our panels and associated equipment were installed by Pacific Marine Electric in Bellingham. thanks for the information. A quick question. I’m guessing the configuration of our boats may be reasonable similar given they are one year apart. Do you have any problem with shadows caused by your radar? Ours radar is on a pony mast. See attached photo. Is yours similar by chance? Looks like I messed up in uploading the photo. Will try again. Incidentally, I think Kittiwake will soon be on the market. Modesty set aside, she’s a very beautiful boat with significant upgrades. She’ll be sold through Seattle Yachts in Anacortes. Korey Scott is the broker who will handle the sale. I plan to add solar panels to our NT32. I am curious about your “tube mounts” – what are they? Could you add a photo. I’d like to install the panels with enough clearance to clean under them. The “clearance” can definitely be adjusted to any amount you desire (within reason). I will try to attach some photos. Sorry about the green munge on the roof, but the water has been off on my dock since 3rd week of Oct. Another photo of the support system. Thanks Tom. The ‘tube mounts’ are called hinged rail tees at Fisheries Supply in Seattle. I had arrived at the same installation you have. I was able to get two rails for free from a local canvas shop that came off a boat. Not completely free though, they need to be cut to the correct width and welded back together. Since they also have a tight bend at the ends I will not need the 90 degree elbows. The tubing is 1 1/4 but luckily if you take out the rubber gasket of those Sea Dog clamps they tighten up nicely to the rail.